Let’s face it: Bad habits are hard to break, and sleeping in the wrong position is no exception. You may have slept the same way your whole life, so changing that now can be nearly impossible. But whether you sleep on your back, side, or stomach, you should know which positions are healthiest, why improper sleep positions are bad for you, and what changes you should make to help your body rest its best. According to The Better Sleep Council, sleep professionals don’t recommend sleeping on your stomach since it causes so much strain on your lower back and can also lead to neck pain (think about how long you lay with your head turned to one side – ouch!). People who sleep on their stomachs report restlessness caused by frequent tossing and turning in an effort to get comfortable – even worse for those who carry a lot of weight in the middle. How can you make it better? If you must sleep on your stomach, The Better Sleep Council recommend using an extremely soft pillow or none at all, so you don’t put your neck at an awkward angle. You should also have a mattress with enough firmness that it doesn’t allow your pelvis to sink or sag into it, which can exacerbate back pain. Putting a pillow under your pelvis may be able to help neutralize your spine. Since 41 percent of adults choose to sleep on their side in a fetal position, it’s assumed to be one of the most comfortable. Side sleeping is great for reducing acid reflux and minimizing snoring and does help with sleep apnea. But side sleepers are likely to experience chronic shoulder pain from pressure placed on their shoulder, and can also have back pain due to hip pressure. And being curled up in a fetal position can restrict breathing in your diaphragm and cause major back pain from keeping your spine curved all night. How can you make it better? Reduce pain in your back by straightening out your body or at least not pulling your knees up as high, and placing a pillow between your knees to keep your spine neutral. Choosing a mattress with memory foam will provide enough contouring comfort to let your shoulder and hip to sink in, reducing chronic pain, but make sure the mattress has enough firmness to keep your hips from sagging. If you’re pregnant, the healthiest sleeping position is on your left side, since it allows better air flow. The National Sleep Foundation says this is by far the healthiest option for most people. When you’re on your back, your head, neck, and spine should be able to rest in a neutral position, minimizing the chances for back and neck pain. Sleeping on your back with your head elevated is also best for battling acid reflux since it holds the acid below your esophagus. 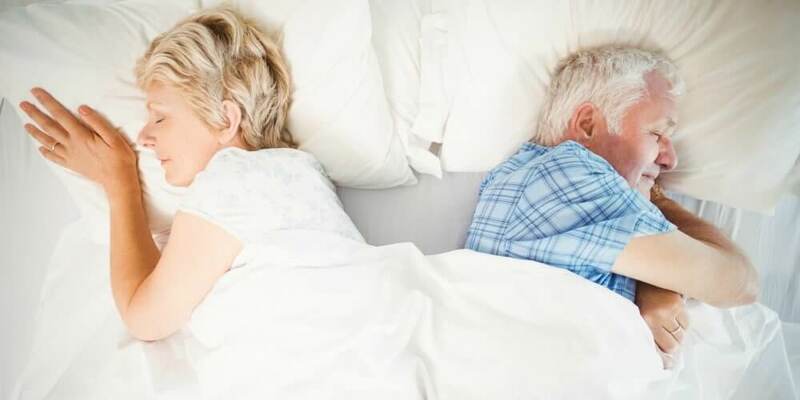 Unfortunately, back sleeping can be one of the worst positions if you suffer from sleep apnea since your tongue can fall back and cover your airway, and it’s one of the most frustrating sleeping positions for couples since it causes snoring. How can you make it better? Be sure to keep your head properly elevated with a pillow that’s made for back sleepers, and choose a mattress that’s not too firm but provides a nice contour to your lower back. Adding an adjustable base under your mattress will allow you to raise the head of your bed to help with snoring and sleep apnea issues. Can a Better Mattress Help You Sleep Healthier? If you don’t want to change the way you sleep, you should adjust your mattress to fit your preferred sleeping position. If you’re a stomach sleeper, a firmer mattress can reduce the arch in your back and neck. Side sleeper? The right mattress can help with your shoulder pain. Back Sleeper? The best mattress for you may be a little softer than the one you have. The sleep experts at Beloit Mattress can help you sleep as comfortably as possible to get the best rest possible. Try out these healthy sleep positions and visit a Beloit Mattress location near you to find the perfect factory-direct mattress. Download your FREE copy of The Ultimate Mattress Buying Guide to make sure you are purchasing the right mattress.